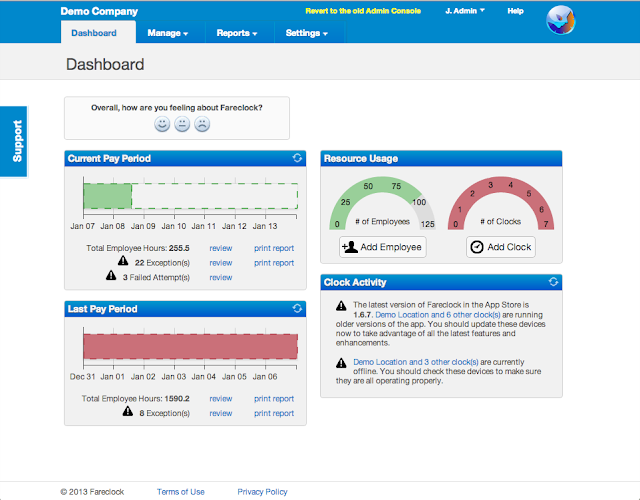 Dashboard information shows top-down view of activity and what administrators should focus on. Cleaner interface, with easy access to advanced features. Streamlined punch review, with optional keyboard navigation. In-pane customer support and chat, with knowledge base article search. New customers will automatically receive the new Admin Console when signing up. Existing customers will still be shown the old Admin Console, with a link at the top to switch to the new one. We will automatically migrate all existing customers to the new Admin Console in the near future. Try it out today, and let us know what you think by submitting feedback directly from the Dashboard.